The poster is a little blurry. But the contest runs from Feb. 26 to May 4. Here’s the link to New Zealand Educated Philippines website. You might want to see the contest’s Terms and Conditions. You can even enter online via this form. The poster image now links to a larger file. 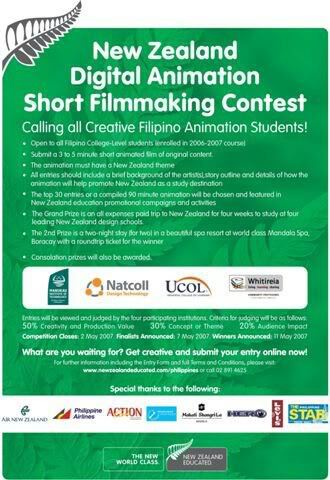 is it just for animation students or freelance people like me can join? any links to a high-res poster?